In this lesson, we will learn how to write a balanced chemical equation given the word equation. We have more lessons on the rules for balancing chemical equations. A chemical equation shows the overall change of reactants to products in a chemical reaction. Sometimes, state symbols are required to indicate the physical states of the substances in a chemical reaction. 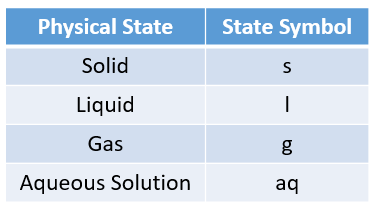 The following table gives the physical states and the state symbols used in chemical equations: solid, liquid, gas, aqueous. 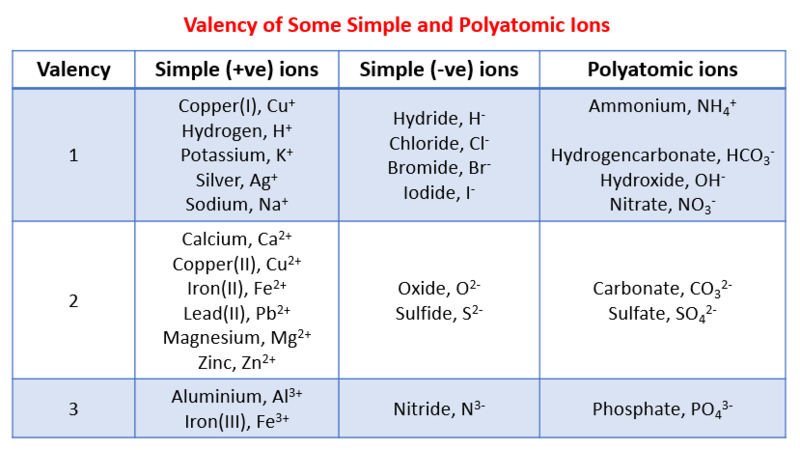 The following table gives the valency of some common ions. This table can be used to help you work out the chemical formula of the reactants and products. The following diagram shows how to write a chemical equation. Scroll down the page for more examples and solutions. In a precipitation reaction, sodium hydroxide solution is mixed with iron(II) chloride solution. Sodium Chloride solution and insoluble iron(II) hydroxide are produced. Write a balanced chemical equation including the state symbols. Step 1: Identify reactants and products and place them in a word equation. Step 2: Convert the chemical names into chemical formulas. Place them based on the chemical equation and write the state symbols. Step 3: Balance the chemical equation. Step 1: Convert the chemical names into chemical formulas. Place them based on the chemical equation and write the state symbols. Step 2: Balance the chemical equation. 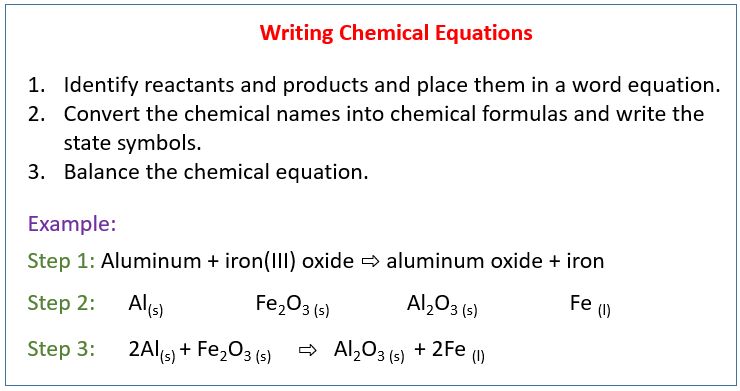 How to write a balanced chemical equation from a word equation? When compounds react, they are chemically changed into new compounds. Every chemical change can be communicated symbolically using a chemical equation. Chemical equations combine formulas with other symbols to show what changes takes place. How to interpret chemical symbols and write simple balanced equations? Each element is represented by a different symbol. All these symbols are in the periodic table. We can use these symbols to show molecules of compounds, and they can show us the ratio of the different elements which combine to form compounds. 1. Ammonium nitrate decomposes explosively to form nitrogen, oxygen, and water vapor. 2. Dinotrogen tetrahydride reacts with oxygen to produce nitrogen and water. 3. Lead(II) nitrate reacts with sodium iodide to create lead (II) iodide and sodium nitrate. 4. Phosphorous reacts with oxygen gas to produce diphosphorous pentoxide. 5. When calcium comes in contact with water, calcium hydroxide and hydrogen gas is produced. 6. When hexane (C6H24) reacts with oxygen a combustion reaction occurs. This reaction produces carbon dioxide and water. 7. Sodium hydroxide reacts with iron (III) nitrate to create a precipitate of iron (III) hydroxide in a solution of sodium nitrate. 8. Mercury (II) oxide decomposes to produce mercury and oxygen. 9. Zinc hydroxide reacts with phosphoric acid (H3PO4) to produce zinc phosphate and water. 10. Sulfur dioxide and oxygen combine to produce sulfur trioxide.